Electrical tape can work very well in many situations. It is designed to work in a wide variety of conditions. Gaffer’s tape is a cloth-based product that is designed to have a low-light reflection and an easy removal without residue. Often, one layer of tape is not light-tight and a second or third layer is needed. Because it is designed for easy removal, the adhesive is on the weak side and peeling can occur when left for a time. Duck tape (sometimes called duct tape) is a cloth-based, plastic-surfaced tape with a very sticky adhesive. When exposed to the elements it tends to degrade after a few months and will leave a residue. Metal duct tape is an aluminum foil-based product with strong adhesive designed for use in high-and low-temperature environments such as the attics of houses. Because it is made of metal, it is completely light-tight in single-layer uses. However, also because of the metal, it tears easily and can develop pinholes. This black paper-based tape is very much like beige masking tape but is light-tight in one layer. The adhesive is weak and peeling can occur quickly. Several companies make black silicone in small squeeze tubes. The product is light-tight and adheres well to a variety of surfaces. It can be removed by peeling off or cutting with razor blade. It has very good temperature latitude. It works well as an adhesive for gluing parts together. Black spray rubber like Flex Seal can be used to coat the inside or outside of a camera body. Be very careful to remove any parts that would be damaged in the use of this product as it will get everywhere. It is easy to mask off and once it has dried to a touch, the masking can be removed to reveal a neat edge. Can be applied in thin coats. This product takes a bit of practice to use and is not like spray paint. Don’t assume you know how to use it before you’ve tested it first. If you are building a camera body from wood, wood putty applied to the joints of the body can be quite effective. It can be sanded down on the outside and left rough on the inside (if your aesthetic allows). Again, when working with a wood camera, wood glue will help fill the space but will need to be finished in an opaque material if it covers an area that is not otherwise light-tight. Leather or its vegan-equivalent, vinyl cloth, can be quite light tight if it is thick enough. Check with a flashlight on a stretched sample of the material to determine its effectiveness. Similarly, other wrapping materials such as a thin veneer of brass or other metal, can provide light proofing at trouble spots like joints. Craft foam sheets, such as that found in craft aisles of stores, can be used as a light seal at openings such as the lens-to-lens mount joints or as a type of “weather seal” around removable film-access openings. It comes in many colors (though not often in black) and thicknesses. Experiment liberally as it is cheap. A staple of hardware stores is weather stripping. It comes in rolls of varying widths and thicknesses, often with an adhesive strip on one side. Warning: while this material compresses, it never compresses to zero so test a little bit to determine how much it adds to the height of the lid, etc. Also available in the same area of the hardware store is weather stripping made of rubber. This makes a tighter seal but does not compress nearly as much as the foam material. 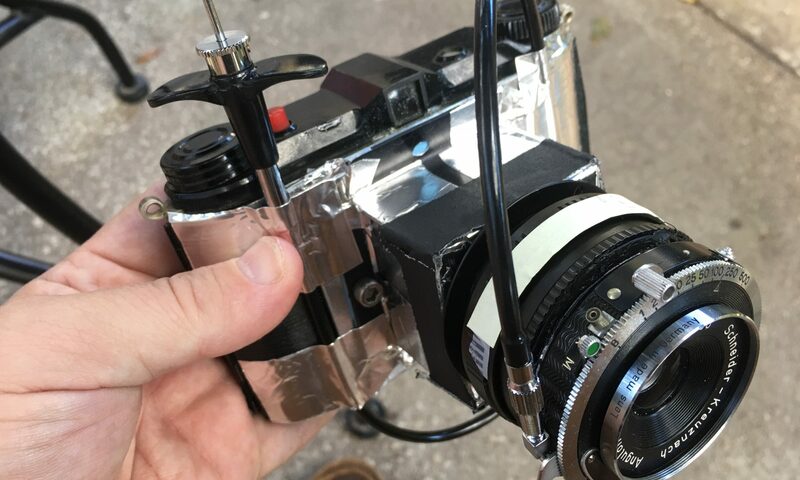 However, it can also be used in the film transport systems of cameras using 120 film as a way of keeping the supply reel and the take-up reel from becoming too loose. This prevents “fat rolls” that allow light leaks.